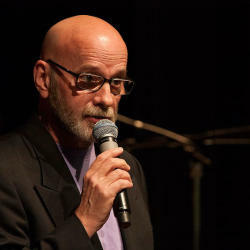 As WBGO celebrates 35 years on air here in Newark, our Music Director, Gary Walker, celebrates 30 years as host of Morning Jazz. Gary started his journey almost 32 years ago at WBGO, and began hosting Morning Jazz each weekday from 6am-10am in June of 1984. On what it takes to host the same program for 30 years, Gary said, "It&apos;s rare that I don&apos;t want to get up and come in to work in the morning. I really love this job, and I don&apos;t think everyone can say that. I discovered jazz by accident, like a lot of people. My dad brought home a new fangled FM radio (a few years back) and I got hooked. I was an announcer at my college jazz radio station in Akron, Ohio. Then, after moving to New York, and within five weeks, found myself at WBGO." As Music Director of WBGO, Gary has probably listened to more music than the next hundred people you run into. Gary receives new music every week, and part of his job as Music Director, is to listen and determine if that album would be a good fit for WBGO&apos;s airwaves. "I wish it was a formula!" Gary said of what makes a record sound great. He continued, "The ears of course are a big part of it, but also the eyes." Eyes? "Sure, the ones in your mind that can see the story being told by the music. That&apos;s especially true for singers. Whether a singer is performing an original tune or a standard, the way that he or she communicates the story is key. There is a creative process that can be heard in certain records - a clear beginning, middle and end that are seamlessly connected. With the advent of CDs, some of those connections became more drawn out, because of the technology allowing for longer recordings. Sometimes a twelve minute piece of music could have told the story in five minutes. Dizzy might have said it in three!" 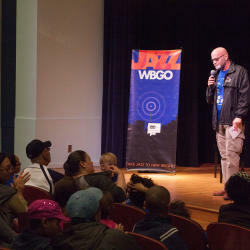 Many new technologies have been employed by WBGO since Gary&apos;s arrival - online streaming, podcasts, WBGO smart phone app, a new transmitter, and a digitization project that has the potential to expand the music library without building an extra wing on the station. Technology has also changed the music industry. As Gary put it, "More people have access to making records because of technology. There could be two or three great albums by vibe players this year, but by the time the fourth or fifth comes out... New artists are competing with the icons to get included in the classic jazz lexicon." Gary selects not only the albums which you can hear on 88.3FM, but also the list we publish six times a year in WBGO&apos;s program guide and the CDs for the CD of the Month Club, which is a Membership perk at a certain level of support. How does he do it? Gary confessed, "Do I bat a thousand? Not a chance! It helps having great ears around me like Michael Bourne, who will tell me about a blues artist or a vocalist, and Rhonda Hamilton will drop something off at my office saying ‘this is great." Of WBGO&apos;s jazz format, Gary says "it&apos;s the freest format around. ‘Classic performance,&apos; I mean, that could mean anything! Every announcer on WBGO has the job of taking this craft and making it part of people&apos;s lives. We think about what the audience might be doing at any given time of day. Inspiration could come from a season, a holiday, something we read in the paper or something coming up on TV. The first thing I do when I come into the office is look at TV Guide. I want to relate to what&apos;s going on in and around the listener&apos;s life. Once, I saw that there was a Marlon Brando festival coming up on Turner Classic Movies. That inspired me to play music that was featured in the film. I also read Entertainment Weekly. It&apos;s a good thing to marry jazz to the main stream. Did you know the male lead in The Good Wife is into Johnny Hartman and John Coltrane? It&apos;s a good thing to marry jazz to the main stream. I have been approached several times by people saying, almost apologetically, ‘I don&apos;t know much about jazz.&apos; They usually follow that by explaining that they like it though. If we, as DJs, can make the music friendly, to tie it into what people are experiencing, to get them to tap their feet and smile, we&apos;ve introduced them to a wonderful world. Feeling the music is a great beginning. I know I learn something about this music every day. No one knows it all."